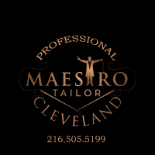 Maestro Tailor When You Look Good. We look good too. Welcome to Maestro Tailoring & Fashion, where the experience of your family's traditional tailor melds with the forward thinking of today's fashion trends. I finally found my tailor! The passion this man has for his craft shows with all of his questions, his advice, and his care while working on your clothes during your initial visit. I was very apprehensive about taking my suits to a tailor because I knew that if they made a mistake, my $1000 investment in my clothes was gone. But he did an amazing job and I can't wait to take all my clothes to him now. The best, period! Very accommodating & convenient. Quality of work is above the rest. Would recommend to anyone. The women working there (I forgot her name) was super nice, friendly and they seem to make a great team! Thanks again. He knows what he is doing. Turned frumpy shirt and jacket into fashionable pieces. Additionally, Mark was extremely patient and interested in having my wedding suit exactly to my liking. Received many complements on it.